Makita has announced the release of their new XOC01M 18V cordless cut-out tool for drywall. 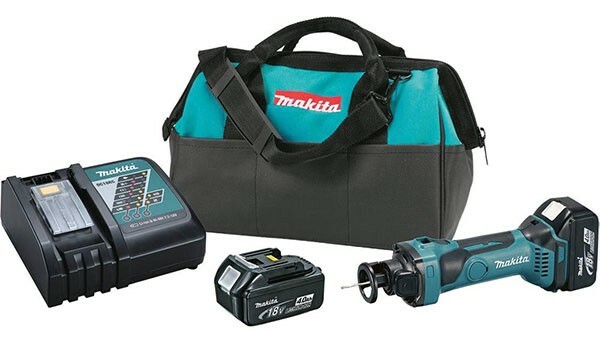 Powered by the Makita 4.0Ah battery, it is capable if making up to 100 single gang box cuts into ½-inch drywall on a single charge. Thanks to the Makita-built motor, the XOC01M delivers 30,000 RPM for fast clean cuts in drywall. It accepts both 1/8” and ¼” bits that can be changed out in a snap with the on-board bit-change feature that eliminates the need for a wrench. The tool features a slim body design and a slide switch with a lock-on features that allows the user to more easily handle and maneuver the XOC01M. The XOC01M kit includes the Cut-out tool, two 4.0Ah batteries, a Rapid Optimum Charger, Spanner Wrench, 2-1/8" Drywall Guide Point Bit, and a Contractor Tool Bag, with a MSRP of $389. The XOC01Z (tool only) has an MSRP of $129. Note: The press release says a wrench is not needed, but the kit comes with a wrench, so I can only assume you can change bits both ways until I hear otherwise.